Summary: What does it mean to write digitally? What does it mean to be a teacher of writing in a digital age? 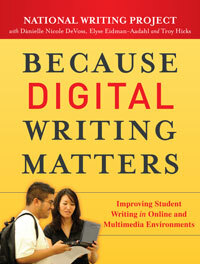 In this introduction to the book, Because Digital Writing Matters, the authors provide an overview in response to these questions. They address historical perspectives on writing, expanding definitions of digital writing, and the impact of the integration of technology on the teaching and learning of writing. In addition, they explore what digital writing might look like in classrooms, including a discussion of the new media literacy tools, strategies, skills, and dispositions that are necessary to operate within our expanding participatory culture. This chapter and related resources may be especially useful for study groups, as well as those planning professional development or developing grant proposals focused on digital literacy.